Microsoft has always been ahead of the curve when it comes to the living-room PC experience, thanks to Media Center. Slick interfaces and powerful audio/video features combine with the power of a full computer to create a nice experience—though it pays if your PC is CableCard-compatible, for full HD over cable. In Windows 7, Microsoft added even more functionality to an already polished package. Most menus share this new look, which pops up whenever you select a song, album, photo or video for playback. In each case, the page looks similar in structure but the information it provides is different. In the case of music here, you can select a track from the album on the first menu; in the secondary "actions" menu, you get choices like "Burn a CD/DVD." Not only has the main pictures browser been tweaked, but now in a new slide show creator, you can hand-pick the photos you want for a slide show on the fly. If you go into the Picture Library, then select "slide shows" from the sub-menu, you can create a new list that puts you in control of the photos in your slide show. The on-screen context menu while watching videos is also redesigned, and it's pretty unobtrusive. One thing Microsoft figured out with Media Center is how to use a gradual fade as a transition between menus and content in their UI. To check out the new Now Playing bar, just use the left/right keys to move through the options at hand. I'm a fan of it, personally. In most on-screen TV guides, trying to browse a few days ahead is either slow and tedious or so fast you miss your target. In Media Center, the Turbo Scroll feature speeds things up a lot. If you hit the left/right arrow keys for a few seconds while browsing the onscreen guide, the channel listings become a blur, but over that blur appears a marker showing day and approximate time, so you can speed up, then stop on a dime when you get to the spot where you think your show is listed. It's probably quite useful, but as you can see in the video above, it's so cool, you'll do it even if you're not looking for anything. Similarly, the music player also has a Turbo scroll feature. Again, if you hold down one of the left/right arrow keys while scrolling through any of the categorized music lists for a few seconds, it also begins to zoom through the album cover thumbnails/song titles/artists, with the general section of the Alphabetically organized library that it's in (Ab, Gi, Se, etc...). When you see you're getting close to the name of the album you want, the scroll also stops fast, and you are free to browse. If you're watching a video (or listening to a song) and you want to exit to the main menu to look at something else, the video (or album art) will continue to play in a slick-looking dissolved background behind the UI. To check it out, just start watching a video or listening to a song, then exit to the main screen while selected media is playing. It's like multimedia multitasking. The nice thing about bringing up Media Center in the Start Menu (or right clicking while pinned to the taskbar), is that it displays a list of frequently accessed sections of Media Center. This can be either specific files, like photos and videos, or functions, such as TV. This saves the trouble of having to burrow through 4 menus to get to something you already have in mind. After hitting the Start button, just click the arrow next to the Media Center icon to bring up the secondary list. When you play a song in Media Center, not only is the album art for the selected song shifting from side to side on the screen, but there's a quilt of all the other album covers cascading down behind it in a fluid motion. It's nice to look at, not to mention a bit hypnotic. Connecting Media Center to Xbox is pretty simple. You start Media Center on your Xbox, and if you haven't set it up as an extender with another machine already, it will ask you if you want to add one, then give you an 8 digit number. Then, you go into settings in Windows 7 Media Center and select Add extender and plug in that number. The setup process will begin, and voila, you have Media Center on your Xbox. 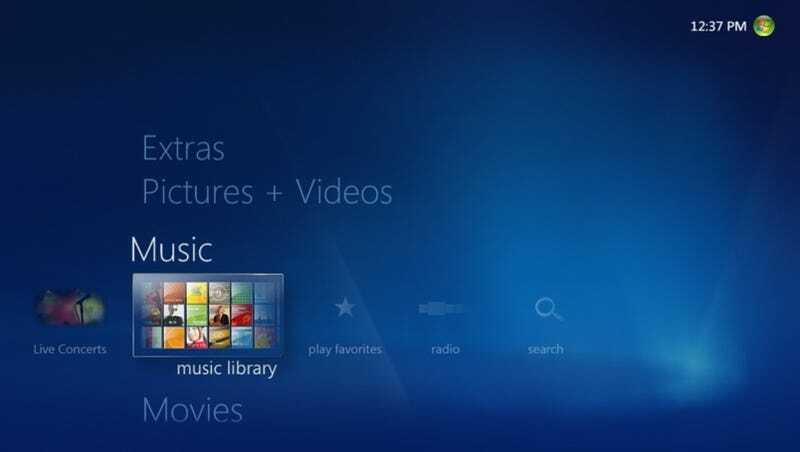 Much of it looks and acts the same as it's Windows counterpart, with one added feature: If you use the Play To feature in Windows Media Player on your PC, it will work with Xbox Media Center. Pretty neat. Inside Tip: In the beta, we learned that it was better for the Media Center PC to be connected via Ethernet or Wireless N to the router. (The Xbox can be connected wirelessly or via Ethernet, it allegedly doesn't matter.) If you have been experiencing a very sluggy Media Center Extender experience on the Xbox, try ditching slower connections and to your computer. One of Win 7 Media Center's most anticipated new features is virtual TV programming, or virtual channels, that make up the enhanced IPTV features hinted at previously. More than just running promotional 2-minute clips, the goal for Microsoft is to offer on-demand full episodes, possibly even from Hulu and other content providers. MSNBC is currently up and running, and the feature looks promising with a nice looking on-screen guide, regularly updated content and the ability to make on-demand video playlists. You can eventually find these virtual channels under Extras. For now, it's just MSNBC that actually works, but the basic idea of mixing on-demand functionality in media center is pretty awesome. When you're playing back any HD video, and you're scrolling along the timeline (back or forward arrow keys, or dragging the timeline) there's a thumbnail that pops up, providing visuals on the scene you're about to skip to. It's like fast forwarding while using Netflix streaming, and it's a pretty useful, if subtle feature. I'd love to see it extended to all video playback. When listening to music, if you select to "Play Photos," it will begin a slide show of sorts, that arranges your photos into a giant wall, then pans and zooms through the lot, fading in from grayscale to a full color view.